Simply a 200km diy Audax with friends on a Sunday. (Simply? 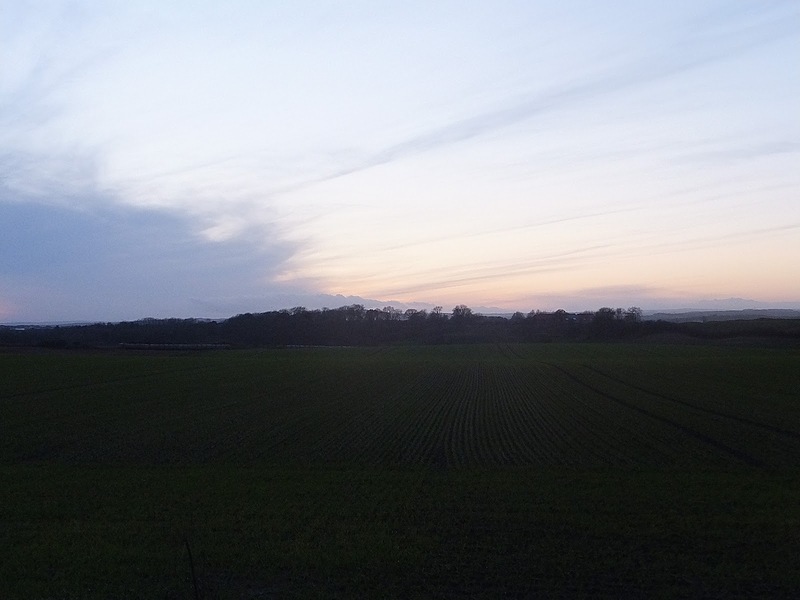 It started and finished in the dark and I was knackered by the time I got home… simply… pah!) I do wonder what could be less interesting to read than a ride report about some friends and I blattering up and down the A167 on bicycles. Sorry: the route was designed to be straightforward and fairly fast, to minimise riding in the cold and dark. I left Durham and rode north on the A167 to the ‘Angel of the North‘ in order to meet friends. Then we turned south and followed the A167 back; all the way down to the Angel pub in Topcliffe. 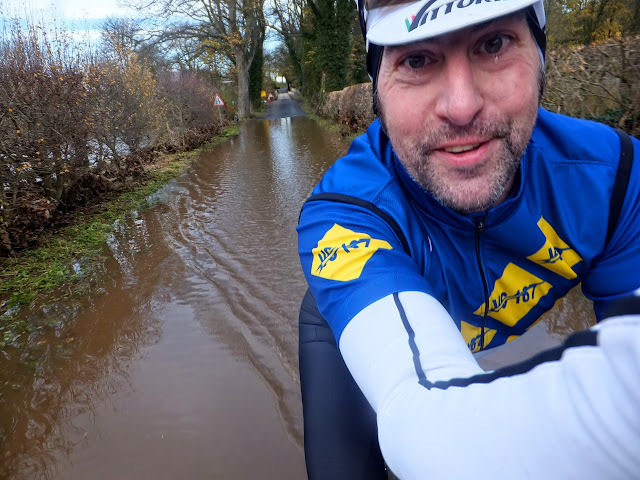 Here we turned around again and headed north… back through Northallerton to Great Smeaton where we finally took to some flooded country lanes and wiggled back to Durham; making the distance up to 202km. This ride was made in the aftermath of Storm Desmond which had battered the UK with gale force winds and record breaking rain. On Saturday evening I’d walked down to the River Wear in Durham, to see the water roaring past – within centimeters of overflowing into the road. Roaring past. The noise of the river was intense, and as I stood there a tree crunched along the edges of the bank in the dark. I felt very small in the face of this expression of nature’s strength. Sunday still hadn’t dawned when I set out in dark at 6:30am; heading north to meet Aidan, Anne and Ulrich at the Angel of the North outside Gateshead, then immediately turning back towards Durham and retracing my tracks. Using the A167 might sound unpleasant (or dangerous? ), but it is a nice wide road and there is plenty of space for cars and trucks to overtake. We were lit up well and I never felt in any danger, plus this was early on Sunday morning and the traffic was very light. 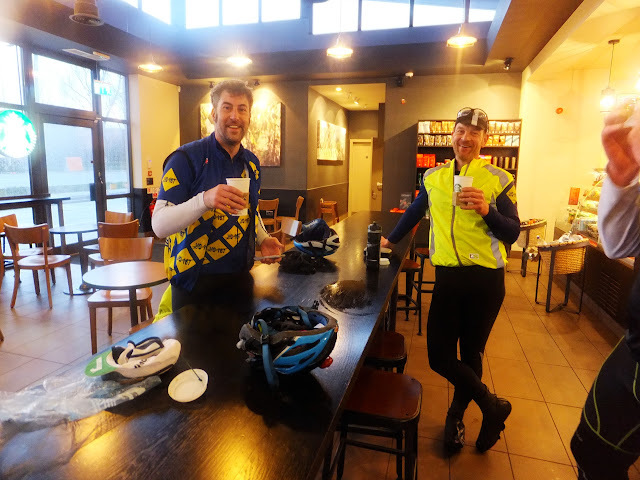 A little bit of headwind and some refreshing rain was the only weather related challenge, but we’d become separated from Ulrich who was not operating to his best strength this morning; so we pulled into a coffee shop at Thinford to regroup. After Thinford we managed to stay together while heading south; down through Newton Aycliffe and Darlington. The prevailing wind had come round and was giving us a push along the road, so we’d kept a fairly constant 30kph in a tight group – although after Northallerton Ulrich had really fallen away from us, and our group split as Anne stayed with him. Aidan and I were well matched and able to ride side-by-side and chat; and with the wind to our right we found that a naturally rolling pattern formed: the outside rider slowly drops back, pulling left and moving up as the other one of us took the extra effort and – in turn – slowly dropped back. This is my first experience of this happening easily and automatically. Topcliffe: 110km. We popped into The Angel which was decked out in sumptuous Christmas decorations. Aidan and I agreed that the pint of Pennine Brewing Co’s ‘Blackfell Porter’ would contain sufficient vitamins and minerals to qualify as a meal. Anne and Ulrich were only minutes behind us. We did not stop long at the Angel, because at this time of year daylight is a scare resource. After about 20 minutes we were on the road again, heading north back along the A167. Ulrich seemed to have gained strength from the stop and we were now able to stay together, this time with Anne and Aidan on the front. Bizarrely the wind had changed direction again and we were experiencing the mystical magical ‘everlasting-tailwind’. With about 140km of cycling up/down/up the A167 we finally left and headed east onto the lanes of Hornby and Dinsdale. Surrounding us were flooded fields and the Tees had broken through its banks and spread across floodplains. It was very dramatic. 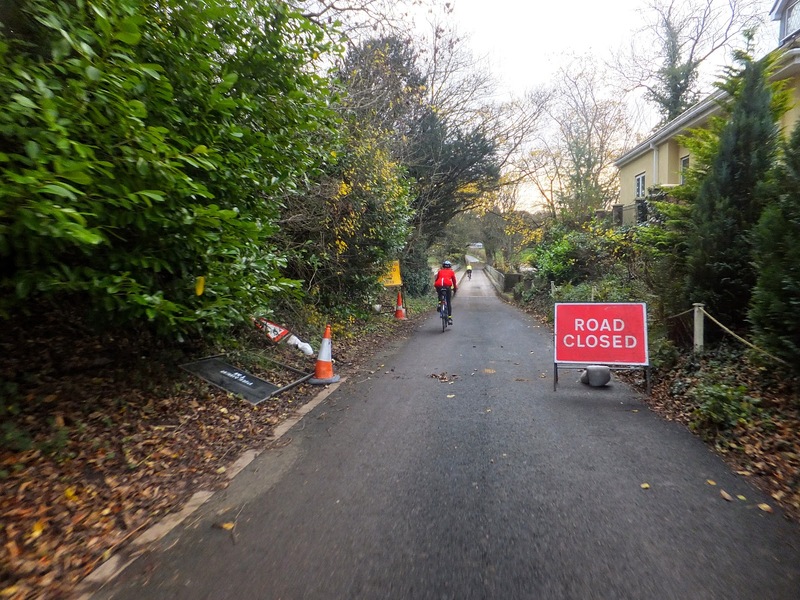 We approached Dinsdale bridge and the ‘Road Closed’ signs were warning us of problems ahead. I’d checked the Environment Agency’s website and was expecting some flooding. The river Tees had broken into the farmland and flooded the road north of the bridge. Some bridges in Cumbria have failed and collapsed, but the Dinsdale bridge seemed safe and sound. Faced with the flooded road, Aidan cycled trough, I followed him – both of us staying dry – and Anne opted to walk through, putting safety first. 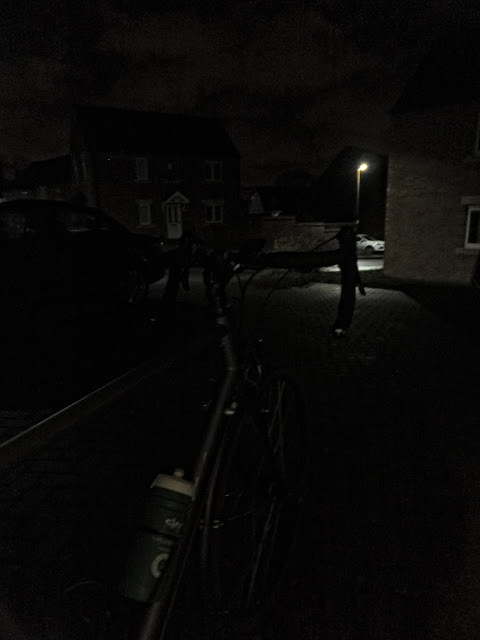 I was really starting to feel tired as we rode along towards Middleton St George, where Aidan broke off and headed directly back home to complete his 200km diy audax. I had to continue north on my route through Sedgefield to Pittington in order to pass the 200km mark. Anne was riding with me, or often slightly ahead of me. Anne is an extremely strong rider and has buckets of energy. As the road became a little hillier she dropped me, so we regrouped in Sedgefield for coffee at Cafe Number Four. The cakes looked enticing! Anne now parted company with me and headed straight back to Newcastle via Durham and I stayed on the lanes east of Durham to ride up to Pittington. The sunset was beautiful but the temperature had dropped significantly – so I stopped to layer up with an extra coat and some glove liners. I arrived home at 4:30pm, 10 hours after setting off, having ridden for under 8 hours. I was cold and exhausted. I think that riding hard down to Topcliffe had emptied my reserves more than I expected and left me with very little energy to get home. But what a warm welcome I had – Carol had prepared a Sunday roast and my daughter guided me through 30 minutes of static stretching exercises – stretching me in places I didn’t know I had places! The benefit was amazing because the following morning I had bounced right back to full strength with no aches or pains. I’m going to have to practice what I’ve been taught – 30 minutes of stretching was amazing. Riding in winter is very hard – even with a favourable wind I think the low temperature sucked extra energy from my legs. I also put more effort in early and paid the price – instead of keeping a steady pace all day long.